Jacqueline Ruth Weaver AO (born 25 May 1947) is an Australian theatre, film, and television actress. She is known internationally for her performances in Animal Kingdom (2010) and Silver Linings Playbook (2012), both of which earned her nominations for an Academy Award for Best Supporting Actress. Weaver emerged in the 1970s as a symbol of the Australian New Wave through her work in Ozploitation films such as Stork (1971), Alvin Purple (1973), and Petersen (1974). In 2005, she released her autobiography, Much Love, Jac. Weaver was born in Sydney, Australia. Her mother, Edith (née Simpson), was a migrant from England, and her father, Arthur Weaver, was a Sydney solicitor. She attended Hornsby Girls' High School and was Dux of her school. She won a scholarship to study sociology at university, but instead embarked upon an acting career. Weaver has been working in Australian film, stage and television since the 1960s. The turning point in her career came in 1965 just before she was about to go to university and was cast in the Australian TV series Wandjina!. Since then, Jacki has performed in thousands of productions through television, film and stage. In 1963, at the age of 16, Jacki mimed the role of Gretel to the great soprano, Marilyn Richardson, in an ABC production of Weber's Hansel and Gretel, conducted by Sir Charles Mackerras. In 1964 at the Palace Theatre in Sydney, Weaver and a number of other Australian singers such as The Delltones and her then-boyfriend Bryan Davies performed a satire on the Gidget movies, in which Weaver performed as "Gadget." In the mid-1960s, she appeared on the Australian music show Bandstand. In one appearance, she sang a 1920s-style pastiche, the novelty song "I Love Onions." Contrary to popular beliefs, Jacki has never appeared in any soap operas. She has performed in more than 80 plays, including her stage work in Chekov's The Cherry Orchard and Tennessee Williams' A Streetcar Named Desire, in which she played Stella. Her stage abilities were recognised with a "Mo" award. In 1980 she appeared in a television production of Sumner Locke Elliot's Water Under the Bridge. Weaver's film debut came with 1971's Stork for which she won her first Australian Film Institute Award. Other notable films during this time include a small role in Peter Weir's critically acclaimed film version of Picnic at Hanging Rock (1975), and a more substantial appearance in Caddie (1976) for which she won her second Australian Film Institute Award. In the 1990s and early 2000s, Weaver found it increasingly difficult to gain roles on screen or television and she devoted much of her energy to the Australian stage, starring in plays including A Streetcar Named Desire, Last of the Red Hot Lovers, Death of a Salesman, Reg Cribb's Last Cab to Darwin, and Chekhov's Uncle Vanya alongside Cate Blanchett and Richard Roxburgh in 2010-11. In 2010, Weaver starred in the Melbourne-set crime thriller Animal Kingdom playing a gang family matriarch. Her performance earned her an Academy Award nomination as well as winning the Australian Film Institute Award, the National Board of Review, Los Angeles Film Critics Association Award and a Satellite Award. Weaver made her Hollywood debut with the comedy The Five-Year Engagement, alongside Emily Blunt and Jason Segel, and starred in Park Chan-Wook's English-language debut, Stoker, alongside fellow Australian actors Nicole Kidman and Mia Wasikowska, and British actor Matthew Goode. On 10 January 2012, Weaver was again nominated for an Academy Award for her role opposite Robert De Niro in the film Silver Linings Playbook. In April the same year, she was cast in the adaptation of Richard Alfieri's play Six Dance Lessons in Six Weeks opposite Gena Rowlands. Weaver had a relationship of many years with Richard Wherrett, Director of the Sydney Theatre Company. She was married to David Price from 1966 to 1970, before marrying Max Hensser in 1975. She lived with Phil Davis, a former Sydney crime reporter, Canberra Press Secretary, and Executive Producer for Mike Willesee, for five years until 1981, before she married the radio and television presenter Derryn Hinch in 1983. She and Hinch divorced in 1998. She had a son, Dylan (b. 1970) with her partner at the time, John Walters. She is currently married to actor Sean Taylor. 1969 Riptide Liz Episode: "Brethren Island"
1970 Woobinda, Animal Doctor Episode: "Chocolate, Cherry or Pistachio"
The Godfathers Matilda Mathews Episode: "Waltzing Matilda"
Spyforce Elaine Harrison Episode: "The Volunteers: Part 1"
1972 Catwalk Rock Wilson Episode: "A Life in the Day Of"
Rush Yvette Precot Episode: "A Shilling a Day"
1988 House Rules Julie Buckley Episode: "The Honourable Housewife"
Super Fun Night Pamela Boubier Episode: "Engagement Party"
^ Weaver, Jacki (2007). Much Love, Jac. Allen & Unwin. pp. 2–7. ISBN 1741750563. ^ Jacki Weaver (2005). Much Love, Jac. Crows Nest, N.S.W. : Allen & Unwin. ISBN 1-74114-618-6. ^ Tranter, Kirsten (2 November 2013). 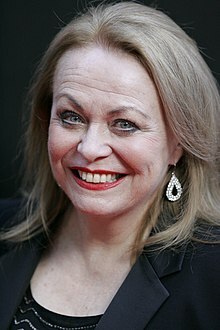 "Jacki Weaver: Hooray for Hollywood". Sydney Morning Herald. Retrieved 19 November 2018. ^ Jones, Caroline (2 June 2003). "Secret Life of Jacki". ABC. abc.net.au. Retrieved 2 December 2013. ^ Galuppo, Mia (2 August 2016). "Jacki Weaver to Play Melissa McCarthy's Mom in 'Life of the Party' (Exclusive)". The Hollywood Reporter. Retrieved 4 August 2016. ^ "Love's Labour's Lost". AusStage.edu.au. Retrieved 3 December 2013. ^ "Fred by Beatrix Christian". AustralianPlays.org. Retrieved 3 December 2013. 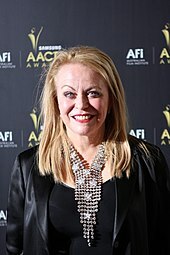 Wikimedia Commons has media related to Jacki Weaver.